Comfort ranks high in the Lunaracer 4’s assets, based on a large number of reviews. It is lighter than the earlier model at only 173 grams. Several runners use the 4th version of the Lunaracer for high-mileage runs or quick workouts. A few remarked that the spring in the cushioning is very noticeable. It has a reasonable price that is within range of most lightweight trainers. The breathability is awesome, according to a handful of reviews. The latest version of the Lunaracer looks more refined than the past model. The cushioning is quite responsive, as noted by some users. It is a really well-cushioned shoe without compromising weight. Heel, midfoot, and forefoot strikers all welcomed the cushioning in the 4th iteration of the Lunaracer. The outsole durability is not what others expected from a shoe designed to work also as a daily trainer. Overall support isn’t as good as before, as observed by a small number of runners. Several of the comments mentioned that it is ½ smaller than the prior version. The toe box is no longer as roomy as before, claimed a few runners. Several users wanted other width options. Complete absence of any reflective details. The Nike Lunaracer 4 is a unisex shoe in men’s sizing that can handle both training and competition. It has more than average arch support, solid comfort, good traction, and unbelievable ventilation. So long as the runner gets the right fit, the shoe should be able to hold up its end of the bargain as a lightweight and versatile shoe. The Nike Lunaracer 4 is a versatile, lightweight performance running shoe. The shoe is very simple looking, however, there are many complex technologies built into the shoe that make it special. Nike uses BRS 1000 rubber as the outsole, a Lunarlon foam midsole and a Flymesh upper. Overall, the Lunaracer is very fast, and very comfortable. The Lunaracer 4 has a lightweight, breathable upper. The lacing system is similar to Saucony’s ISO fit. There is a sock like bootie and an external cage of fingers that wrap around the foot and hold the laces. The difference between the lunaracer and ISO fit is that the ‘external cage’ is not completely external; It is attached to the bootie. The lacing was not as adaptable or secure as a true ISO fit shoe. I found my foot sliding around in the shoe whilst running. The laces are very standard flat laces. These laces do not come undone while running unless they are tied very loosely. The upper is made from a single layer of stretchy mesh. Since the upper is stretchy, I did not get any blisters or hotspots while running in this shoe. The mesh was a little bit too stretchy, which led to an unstable feeling while running. This mesh is perforated to enhance the breathability of the shoe. A good way to test how breathable a shoe is, is by putting it up to your mouth and literally breathing through it. My breathing felt unobstructed, which shows just how breathable the shoe is. Since the upper is so minimal, the your feet are very susceptible to the elements. Rain will wet your feet and cold air will freeze them. In my opinion, this is a good problem to have in a racing flat. There is a small amount of cushioning material in the heel collar so that the shoe is still comfortable when it is tied very tightly. There is a very narrow piece of plastic in the heel that acts as a heel cup. When I first received the shoe, I thought that this heel cup was a joke. I didn’t believe that such a small piece of plastic could help with the fit and increase the support of the shoe. I was very wrong. The heel cup is angled forward towards the rest of the shoe. Because of this, the heel of the shoe is always pressed up against my foot no matter what part of the gait cycle I am in. The small insubstantial heel cup helps the fit considerably. The Lunaracer 4 has an adaptable fit. The stretchy upper and the lacing system give the shoe the ability to fit most feet. The toe box of the Lunaracer 4 is narrow. It has a very straight fit on the medial side of the shoe, however, the lateral side tapers off a little bit too much. My pinky toe is squished between the upper and my next toe. The stretchy mesh helps compensate for this narrow platform but also makes my foot slide around. There is no reflective material on the shoe. The midsole is where this shoe shines. The midsole is made of an EVA shell, filled with Lunarlon foam, underneath a strobel board. Lunarlon is a very lightweight and soft foam. Lunarlon is so lightweight that this shoe has the best cushion to weight ratio out of any shoe on the market. This soft cushion gives the shoe a protective feeling while still being light and fast. The hard EVA shell gives the shoe more longevity and causes the shoe to be more stiff. The first time that I ran in this shoe, I thought that this was another firm racing flat. Once I broke in the shoe, the EVA shell compressed and gave me the soft feeling that I was looking for. This shoe is still a racing flat, so I wouldn't want it to be a soft as a Hoka, but it is a very nice blend of cushion and speed. Nike uses a technology called Waffle Pistons on the perimeter of the midsole to enhance the shoes’s responsive feeling. These pistons look like an accordion in its compressed position. The pistons compress when your foot strikes the ground, and rebound at toe off to give the shoe a springy and responsive ‘pop’. This technology works particularly well with lunarlon foam. The pistons protect and lengthen the lifespan of the Lunarlon foam. Lunarlon foam on its own would not be very responsive, however, the Waffle Pistons allow you to feel the soft feeling of the Lunarlon foam and have a responsive ride. While walking around in the Lunaracer, you are not putting enough pressure on the Waffle Pistons which makes the shoe feel hard. The shoe uses a strobel board construction which means that there is a very hard piece of material underneath the sockliner. This means that your foot does not sink into the midsole. The epicenter of the midsole compression is at the contact point between the shoe and the ground, not where your foot meets the shoe. This makes your stride more efficient by forcing you to engage more of your foot and lower leg muscles, despite the cushioning. In short, a strobel board makes a shoe faster and less comfortable. There is an eight millimeter drop between the heel and the forefoot. This is enough drop so that heel strikers will rapidly transition from heel strike to toe off. This is also a comfortable, but large amount of drop for a forefoot striker. The reason that the drop doesn’t bother most forefoot strikers is because when running races, especially in racing flats, forefoot striking tends to be more pronounced. The large rubber pads in the heel and forefoot areas make the shoe compatible with the landing zones of both heel and forefoot strikers. The outsole is made of rubber pods and foam pods. The rubber material that Nike uses is BRS 1000, which is a standard carbon rubber compound. This rubber gives the shoe great traction on wet roads. It also helps you run fast by letting your toe off powerfully. The rubber makes the outsole the most durable part of the shoe. The shoe has a lifespan of about 250 miles due to the short lifespan of the midsole and the upper. The rubber will definitely last longer than 250 miles. The foam that Nike uses on the outsole is the same hard EVA that Nike uses on as the hard EVA shell for the midsole. The Nike Lunaracer 4 has a very wide platform. This enhances the stability, helping you run more comfortably on tilted surfaces. This enhances the versatility of the shoe. The stability gained from the wide platform of the shoe does not compensate for the instability of the looser fit. The lunaracer is moderately stiff. The pods of rubber and foam are strategically placed in rows to reduce weight and to add flexibility. There are little grooves cut into the midsole between the pods that give the shoe a little more flexibility. The little bit of flexibility enhances the comfort of the shoe. These grooves are shallow because fast racing shoes are stiff so that they can be more responsive. There is a nike+ box in the middle of the outsole. This is the second best looking running shoe on the market. The best is the New Balance Vazee Pace in the blue, red, and orange color. Nike shoes in the Olympic Colorway are the second best. Normally, I do not take looks into consideration when I buy a shoe (which is evident by my pair of Brooks Neuros), but this shoe looks so good that I might choose it over a more functional running shoe. Because of the good looks, I wore the Lunaracer 4 to a dance. At the dance, everyone was repeatedly sprayed by paint guns. Now the upper is stained and it looks a little less cool. I used the Nike Lunaracer 4 for long races, interval workouts, and tempo runs. This shoe truly excelled in these areas because it is as fast as a racing flat and as comfortable as some other training shoes. The Lunaracer can work as a daily trainer, however, it will only last about 250 miles which is the reason why I almost always choose other shoes. This shoe is best for casual runners who need a good looking pair of sneakers, or competitive runners looking for another pair of running shoes for uptempo running and racing. -0.5 indicates that you should buy 0.5 sizes smaller in a different shoe; -1 indicates that you should buy 1 size smaller in a different shoe. These two shoes are very similar. the Lunaracer has an 8 millimeter drop. The two shoes are pretty equal in weight. Nike says that their shoe is lighter, however, Nike makes their shoes small, so that they can claim that their shoes are lighter than they are. The Fastwitch has much more support than the Lunaracer. The Fastwitch has a 4 millimeter drop and very firm foam. The Lunaracer is about the same weight as the Fastwitch. The Lunaracer is more comfortable, however, the Fastwitch has a better lockdown on the upper. The Lunaracer has a wider platform than the Fastwitch. Buy a full size down in the Fastwitch. The Hyperion has a 10 millimeter drop. Although the Hyperion has much more drop, the Lunaracer 4 is better for heel strikers. The Hyperion has a much more comfortable and secure upper. The Hyperion also has softer cushioning, however there is less cushioning than the Lunaracer 4. The Hyperion is much more flexible than the Lunaracer. The Hyperion is a little bit lighter than the Lunaracer 4. Buy a full size down in the Hyperion. The Adios Boost has a 10 millimeter drop. Both shoes are equally stiff on the long axis of the shoe. The Adios Boost has more torsional rigidity. The Lunaracers cushioning is a little bit softer than the Adios; the Adios is more responsive. The Adios Boost is 1.5 ounces heavier than the Lunaracer: A considerable amount. The upper is much more secure on the adios, but it is much more coarse, and therefore less comfortable. Buy ½ size down in the Adios. The One’s cushioning is softer than the Lunaracer’s. The One has an even looser fit than the Lunaracer 4. The toe box is much more comfortable in the One. The One is more flexible than the Lunaracer. The One is more of a training shoe than the Lunaracer. There is a better rubber coverage on the outsole in the Lunaracer 4. The One has a zero drop platform which makes it exclusively a forefoot striking shoe. The One is a little bit lighter than the Lunaracer 4. Buy a full size down in the One. Both shoes are high end long distance racing flats. The 1400 has a 10 millimeter drop compared to the 8 millimeters in the lunaracer. The lunaracer is still better for heel strikers because the 1400 lacks adequate cushioning. The 1400 is more flexible and the midsole is considerably more firm than the Lunaracer. The fit is more secure on the 1400. The lunaracer has better grip than the 1400. Buy a full size down in the 1400. The Lunaracer 4 and Zoom Streak 6 are similar shoes. The Zoom Streak has the same upper as the Lunaracer. Both shoes also weigh the same amount. The Zoom streak has a much more firm and responsive midsole. It is a little bit more flexible than the lunaracer. Both the Zoom Streak and the Lunaracer have an 8 millimeter drop. Overall, this was a very fun shoe. I took off points because of the insecure fit, and the instability that it caused. I also took off points for the narrow toe box. There are some people out there who will run in nothing but Nike shoes (I used to be one of them). If you're exclusively a Nike runner, you should give this shoe a try. It is their best running shoe. For everyone else, this is not the fastest or most comfortable shoe on the market, but it has a unique, soft and fast ride that I found rather appealing. I enjoyed Nike Lunaracer 4. I had read that the LR 4 ran about a half-size small, but I had remembered hearing this with the LR 3. Well, I’m here to tell you that the LR 4 is built differently but not necessarily shorter. Keep reading……. I wear a 9.5 US for casual wear, however always order up in my running shoes to make room so that my toes don’t bump the ends of my shoes during workouts. I made no exception to the Nike LR 4, as I ordered the LR 3 in size 10. The LR 4 fit more narrowly than the LR 3, and they felt shorter. I thought the toe box was comfortable, although a bit more snug than the LR 3. The arch support was adequate for my medium arches and gave good support. It felt like these shoes were shorter than my LR 3 because my big toe felt like it was at the very end of the shoe. The first thing that you are going to notice is the large holes in the upper allowing for great foot ventilation. Next, you will see that Nike has changed the lacing engineering from the LR 3. Look at the pictures and you will see how the laces enter the upper from the side opposed to vertically, like most every shoe that I have ever had. I don’t like it when my laces don’t lie flat on the tongue so this bothered me, although I think I was able to get more support from the laces. Gone from the LR 3 are the Fly Wires that helped to support the medial part of your foot. The forefoot cushioning was just like in the LR 3. This helps to keep my feet from getting beaten to death on my long runs. Along with the great cushioning, these shoes provide a great heel-to-toe snap making you feel like you are flying. The shoes weighed in at 6.14oz compared to the LR 3 at 6.98oz. The advertised weight is 6.1oz for a size 9. 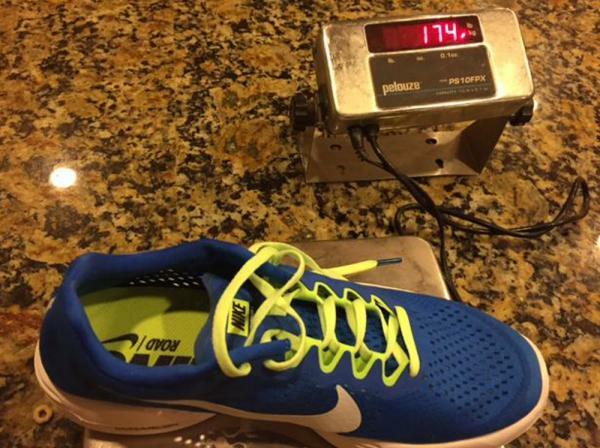 So, how did Nike get to the new weight in the same size? I alluded to comments about the shoe running short and that it felt short on my foot. In reality, the shoe is no shorter than the LR 3. Also, Nike has made the shoe narrower than the LR 3. I decided to give the shoes a few runs to see if the shoe would loosen up and become the greatest shoe that I had ever run in. I gave the shoes three good runs, an easy recovery day run of 6 miles, a speed workout consisting of 3 miles high intensity (8, 800’s) followed by 3 miles at high intensity, then a moderate 18-mile run. While I did get the cushioning that I was hoping for, the support of the LR 3. On top of this, my feet always felt like they were at the end of the shoe. I won’t really know about the durability of this shoe as I decided to return them. I considered going a ½ larger (10.5 US) but felt like I might lose more foot support to gain the length that my feet wanted from the end of the toe box. A comfy pair of racing trainers capable of going long distance. I’m going to break this review down into the sections that I feel most important to me as a runner. The flyknit mesh is lightweight and apart from the heel section has no real structure to it. The mesh is covered in holes meaning breathability is not an issue - even with twin skin socks, I had no overheating issues during a 28°C 10k sprint. The tongue/lace design works but does annoy me. Making sure you get the tongue in just the right place prior to any run is essential. As the tongue is also lightweight, it folds over on itself which can be annoying. The only other characteristic worth noting is the size - it does size small and even sizing up, I felt my toes were well locked into the shoe. I have run on many zoom based soles before so wasn’t sure what to expect with the Lunarlon foam. However, it is exceptional - I truly know what it feels like to float now. I also can’t believe how there is so much support for such little weight; with the insert the overall shoe comes in at 198g and without 174g. You have to remind yourself the trainers are attached - they really inspire you to push during the race. The tread is designed mainly for road/tarmac which provides good levels of grip. In wet conditions it is okay, that depends on how much surface water there is. So this is actually my second pair of Lunaracers. As comfy as the sole is, it isn’t designed for huge mileage before it wears so I want to share the load across 2 pairs to keep them fresh. However, I had forgotten the initial bedding in pains. It certainly isn’t a pair you put on for the first time and race but after 2 or 3 5k runs, the shoes are ready for race day. The flyknit mesh colors look great but are a pain to keep clean - you need to keep these trainers for best unless you like regularly shampooing the outer. I recently used these on race day for my first Ironman 70.3 and they felt great - even better than I expected. I did have to spend extra time in transition making sure the tongue was in the right place but it was worth it. These eat up the miles and provided you wear your go-to socks they allow you to pass through any road race without blisters or repercussions. I train a lot in my Pegasus trainers which are good training shoes but they have nothing on the Lunaracers. These two different types of Nike shoes are in 2 different leagues. comfortable racing shoe that looked great, felt great and ran great. A lot of alternatives that I considered compromise on cushioning for reduced weight but that is not something required whilst using a Lunarlon sole. I still have gripes about the fit but if you are careful you can get it right. Note, I opted to try triathlon elastic laces but they just work with the upper having no structure. The only other gripe is the mesh - it doesn’t clean well. My first pair of Nike Lunaracer 4 came in the ULTD color scheme and the yellow is no longer yellow. Yes, I did run in them in mud but I didn’t expect them to permanently change color. However, these are both insignificant - right now I wouldn’t want to race in anything else! Nike reduced the weight without the Flywire without compromising support. Nike goes back to old school in the 4th incarnation of the Lunaracer. In this version, Nike removed the external overlays to create a more sophisticated and refined look. There are also more synthetic overlays to provide security and support as the cords have been removed. The new engineered mesh is more breathable with just enough structure to hold the foot really well with still enough give for better comfort. The midsole features a new dual-density Lunarlon foam for better support and cushioning. As it is now made of two densities, there is a nice blend of firmness and softness for shock-absorption and responsiveness. The interior of this Nike shoe for running offers also a new arch band for enhanced medial support and structure. For a lightweight shoe that is also designed for training, the new design helps, particularly as the miles pile up or when the runner gets fatigued. The Nike Lunaracer 4 continues to offer a racing shoe kind of fit, which is quite snug in the heel to the forefoot. There is excellent heel and midfoot hold for support and security. Runners who require more room in the toe box may need to go half a size up. The sizing of the shoe is generally standard. The underfoot is a typical combination of Waffle outsole with square patterns for traction on different surfaces. Nike covers the heel and other high-impact areas of the 4th ride of the Lunaracer with very durable BRS 1000 carbon rubber. The midsole is a full-length and dual-density Lunarlon foam. Nike encases the soft density with some firmness to deliver the right mix of cushioning, support, and responsiveness. As the foam spans the entire midsole, there is improved transitions through the gait cycle as well. A large portion of the upper is a simple combination of Flymesh and synthetic overlays. It has optimal breathability with enough support and security without the use of the Flywire cables. A molded EVA sockliner helps with the cushioning and step-in feel of the Lunaracer 4. Nike uses the common lace-up closure to get the right fit.